NEW ORLEANS – After an eventful Conference Championship Weekend in NCAA Division III Cross Country, not much changed in the top-10 of the most recent Women’s National Coaches’ Poll that was released Wednesday by the U.S. Track & Field and Cross Country Coaches Association (USTFCCCA), but nearly everything changed otherwise. Johns Hopkins still holds down the top spot as the unanimous No. 1, followed by No. 2 MIT, No. 3 SUNY Geneseo and No. 4 Williams. Wheaton (Ill.) broke a fifth-place tie with Claremont-Mudd-Scripps and now occupies the No. 5 spot all by its lonesome. Further down the index, UW-Eau Claire, Hope and Tufts all vaulted four or more spots from where they were in Week 6. UW-Eau Claire went from No. 19 to No. 11 after winning the WIAC crown. The Blugolds put five runners in the top-10 (2-6-7-8-10) and beat UW-La Crosse by a score of 33-59. This is the best UW-Eau Claire has been ranked this late in the season since 2012. Hope rolled to the team title at the MIAA Championships and nearly swept the proceedings. The Flying Dutch went 1-2-4-5-8 behind the dynamic duo of Alexis Guttilla and Emily Hamilton up front. Hope improved its ranking from No. 18 to No. 12. Tufts finished a game third at the NESCAC Championships behind Williams and Middlebury. The Jumbos scored 82 points compared to the 62 for the Ephs and 77 for the Panthers. Tufts will enter the New England Region Championships ranked No. 13 in the nation. Without a doubt, the biggest jump of the week belonged to Nebraska Wesleyan which went from No. 28 to No. 17, its best ranking since 2011. The Prairie Wolves won the Iowa Conference and did so by placing five women inside the top-15. Elsewhere in the poll, Ithaca, Emory and St. Thomas (Minn.) all moved up three or more spots. The Bombers won the Liberty League title and come in at No. 24, while the Eagles and Tommies placed third at their respective conference championships. Colorado College and Amherst are brand new to the poll at No. 34 and No. 35, respectively. This is just the fourth time in the past 12 years that the Tigers have been ranked this late in the season, while it’s the Mammoths’ fourth in a row. 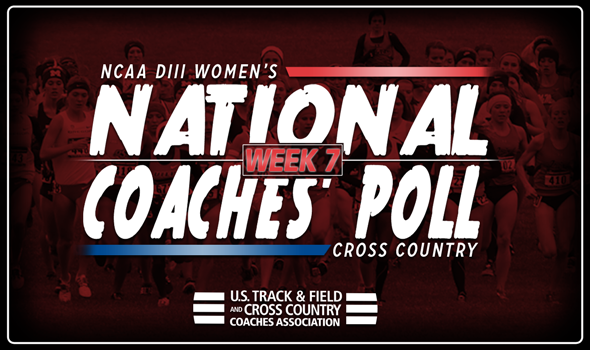 The next National Coaches’ Poll will come out November 13 in advance of the 2017 NCAA Division III Cross Country Championships five days later in Elsah, Illinois.